IN WHAT could be President* Trump’s latest subversively contrarian staff hire — you know, the kind of thing that made him hire former Texas Gov. Rick Perry, who couldn’t stand the Environmental Protection Agency, to be in charge of the Environmental Protection Agency — Trump is considering Corey Lewandowski, the irascible, assaultive Trump 2016 campaign manager, for a return to House Trump. You remember Corey. 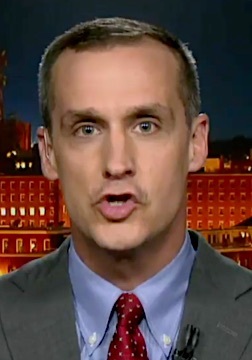 A walking IED, Lewandowski was fired from the Trump campaign he directed in July 2016, facing battery charges after rather physically moving a reporter out of Trump’s path. This after weeks of baiting and taunting the media and vilifying anyone who didn’t kiss The Donald’s ring. The president* is weighing Lewandowski’s return, and that of former Trump deputy campaign manager David Bossie, to help with rapid-response messaging in the wake of the still-mushrooming scandal surrounding Trump, the campaign and Russian involvement in the 2016 election process. 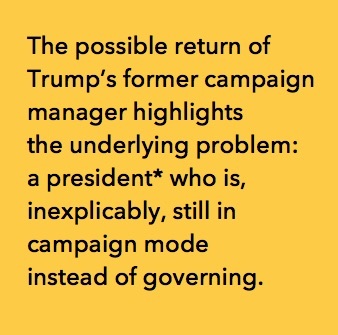 But as much as anything, the possible return of Lewandowski and Bossie to the Trump fold speaks volumes about one of the biggest problems the administration has to confront: a president* who is, inexplicably, still in campaign mode instead of the one required to govern a nation and its people. If he comes back, Lewandowski’s likely to be the marquee headache. House Trump is deciding how best to use this daffy thug to the president’s* advantage: Will they let him run loose in the White House or keep him chained up on K Street or Z Street or wherever they quarantine the mushwits in Washington (the ones who aren’t on Capitol Hill)? The biggest problem to be solved is the one that sits in the high chair at the White House. The crises that Lewandowski and Bossie may be brought in to fix have their origins at Trump’s own gilded doorstep. Which probably won’t stop either of them from creating issues of their own. Perversely, the administration plan makes practical, tactical sense. When it gets crazy, you double down on the people you trust, the support system that keeps you going — the same one that, to one degree or another, helped get you where you are. “At times of crisis obviously it’s important that you surround yourself with people you can trust, and Corey certainly has proven his loyalty,” said Alex Conant, a partner at the public affairs firm Firehouse Strategies, and Florida Sen. Marco Rubio’s communications director during the 2016 campaign. BUT. “The challenges Trump faces are not his staff’s fault. Staff changes won’t matter unless they come with systematic changes to how the president is running his White House,” Conant told Politico. And that’s the problem with bringing these two back under the big top. They’re not what’s needed by Trump & Co. They’re the opposite of what’s needed. They’ll probably exacerbate the situation, making things worse for everyone. They’re likely to be a case of fighting fire with gasoline. TRUMP’S POSSIBLE addition of Bossie confirms this. Most recently Bossie has been chairman of the conservative advocacy group Citizens United, and from that position took point in advancing the case that led to one of the Supreme Court’s most momentous decisions, Citizens United v. Federal Election Commission, a ruling that basically empowered corporations to impersonate human beings for the purpose of influencing political campaigns with mountains of cash. But in the early 90’s, Bossie was on the staff of the Senate committee investigating Whitewater, and thus starting his career as a Clinton bête noire. In 1997 and 1998, he was an investigator for the House Oversight and Government Reform Committee, tasked with finding campaign finance irregularities by President Clinton — a hot-dog job he performed with relish. 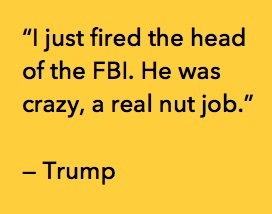 Until he got fired by the people who hired him, for going too far. 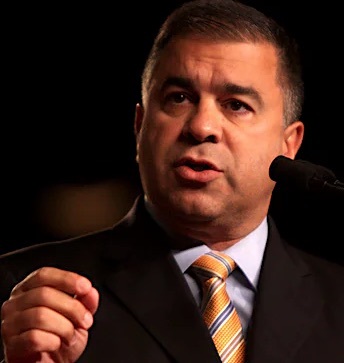 “David Bossie is so craven and maniacal that in the heyday of the overreaching, Gingrich-era Congress, the top Whitewater conspiracy theorist in the House had to fire him for doctoring evidence,” said Bill Clinton campaign chairman John Podesta, to The Guardian (UK) last September. “He certainly knows how to set fires,” said Clinton administration image medic Mark Fabiani, to Politico. “Whether he’s good at putting them out or not, I have no idea.” A saga to be continued ... until it’s discontinued. Image credits: Lewandowski: Fox News. Trump: Mark Wilson/Getty Images. Bossie: Gage Skidmore/Creative Commons. IT’S STARTING to happen, little by little, our remembering of the events of the watershed year, 1967. Between now and the end of the year, we’ll make that even-numbered anniversary journey, revisiting the March on the Pentagon, the race riots in Detroit, the riots in Newark, the Biafra civil war, the riots in Cairo, Ill., and Durham, N.C.; the appointment of Thurgood Marshall as the nation’s first black Supreme Court justice; the dawn of the Haight-Ashbury scene; Hair’s premiere on Broadway, the release of In the Heat of the Night … and the riots in Cambridge and Memphis and Milwaukee. “Jim Marshall 1967,” a retrospective of cultural events of the year through the eyes of the renowned rock photographer, just closed at the Grammy Museum in Los Angeles. But like the next wave coming in off the ocean, two more revisitations are happening now, one of them a full-on sonic reimagining of everything we heard before. Are You Experienced? (released May 12, 1967) by the Jimi Hendrix Experience and Sgt. 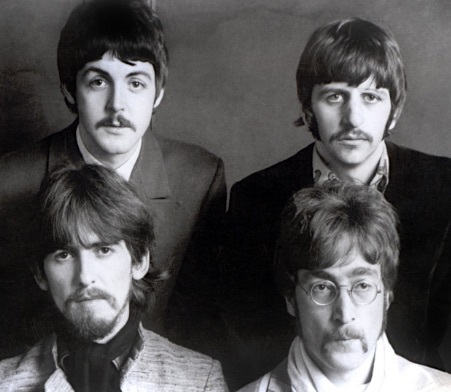 Pepper’s Lonely Hearts Club Band (released in the UK May 26, ’67, in the US June 1) by the Beatles both put the world on notice that the dovetailing of culture, innovation, technology and opportunity that made the decade what it was fast becoming had reached some wild zenith, a high point of creativity. They stand as signposts, benchmarks of the era, the two serial musical events that presaged the future, and announced to a still wary, curious general public the era that was, even then, very nearly over. These two cultural upstarts — the Liverpool band that bottled the zeitgeist only three years earlier, and the Seattle guitarist who transformed the palette of his instrument and the sound of rock music like no one before or since — brought out records back to back … and changed everything. All the innovation in the world won’t help you if no one’s listening. Neither record would have mattered — maybe neither record would have happened — if there wasn’t a public ready to receive it. 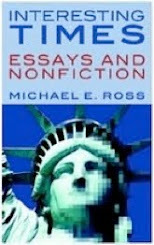 By 1967 rock as art form had been confirmed in the mind of the public; the latitude and permissions of society had evolved enough in other spheres of the social life to make open minds at least possible. The public was ready for the distillation of rock’s best practices, the music in its highest and best use. Hendrix and the Beatles rose to the occasion. And 50 years later, we still hear the broadsides they fired on our expectations. From that tree-ring distance, certain things about Are You Experienced? become clearer than ever: its embrace of violence and danger, depression and sexuality, dreams and the flights of the imagination — all of it in a sonic context no one could have imagined. Hendrix had able fellow travelers in Noel Redding, a fluid, nimble bass player, and Mitch Mitchell, a drummer whose machine-gun precision helped give their sound a fearsome energy. But the Jimi Hendrix Experience was Jimi’s vision, start to finish, and never more purely executed than at the beginning. “Purple Haze,” of course, set the table, and the terms of engagement. 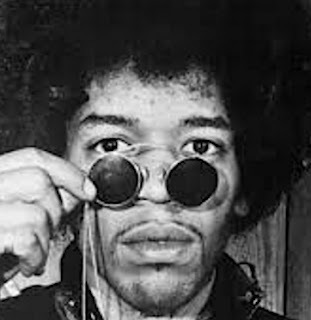 The first track on the album established the scape of Hendrix’s daring, and revealed the comfort and confidence he already had in his style of playing, and the vision underneath. This first single from the album, heavy with the virtuosity of Hendrix’s guitar at full throttle, was just right for radio, with the brevity and punch to be heard and remembered above the radio menagerie of Animals, Byrds, Monkees, Hermits and Stones. 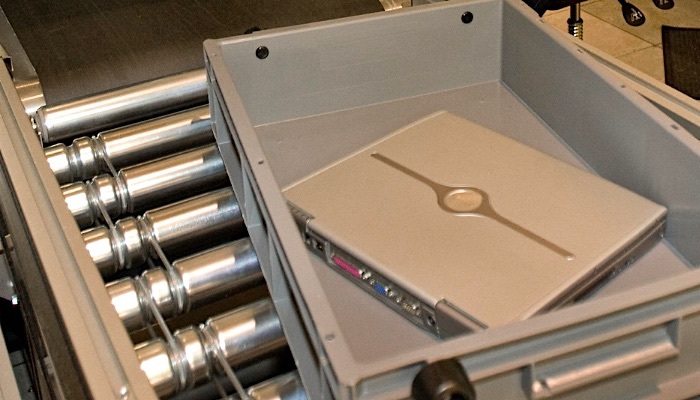 Months after the federal Department of Homeland Security banned large electronic items on U.S. bound flights originating in the Middle East, the agency is ready to double down in unsettling ways, with a proposed ban on laptops and tablets in cabins of U.S. bound flights from Europe. It hasn’t happened yet, but there’s a sense that the Trump government is quietly laying the groundwork for putting a ban in place. But DHS' proposed ban expansion may be just as upsetting for legions of other travelers: everyday people taking vacations or personal travel — people eager to document their travels for posterity (or for blogs, friends and family). 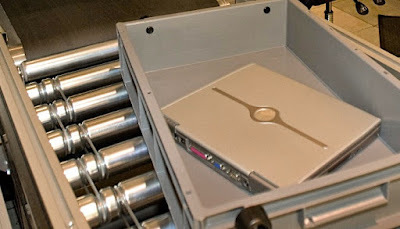 Image credits: Laptop computer at airport security station: Via CNN. Wander logo: © 2017 Jerrick Ventures LLC. I’ve been blogging about you forever, it seems, on and off, even before the campaign that has landed you, inexplicably, in the White House. The fruition of your 2016 campaign has propelled you into an office that, frankly, I thought you had no more realistic chance to occupy than any reasonably talented golden retriever. But we are where we are. You’re in the Trump Hotel at 1600 Pennsylvania Avenue, and we’re obliged, one way or another, to accord you some measure of the respect that this awesome address, and its prime occupant, deserve. Since Jan. 20th, bloggers, writers and other civic-minded scribes have been wrestling with the language, trying to find a way to describe you that's both accurate and truthful. Some have been using only your last name; I’ve been going with “president-apparent” and “president presumptive” as a way to describe you by title. Once I even toyed with POTUSINO (President of the United States In Name Only) but that was too much jargon by half. Image credits: Trump: PhotosForClass.com. The Swamp logo: © 2017 Jerrick Ventures LLC. WHEN PRESIDENT* Donald Trump left Friday for his first foreign trip in his new job, he brought along two pieces of carry-on baggage he couldn’t have left behind if he tried. Both will have a lot to do with whether his first White House trip abroad is or is not his last. 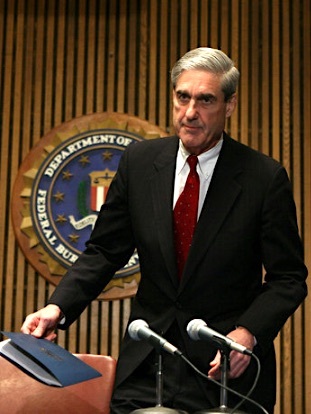 First, of course, there was the surprise Wednesday announcement of Robert S. Mueller III, former FBI director, to assume the role of Justice Department Special Counsel investigating possible collusion between the Russian government and the Trump campaign to subvert the process and/or results of the 2016 presidential election. 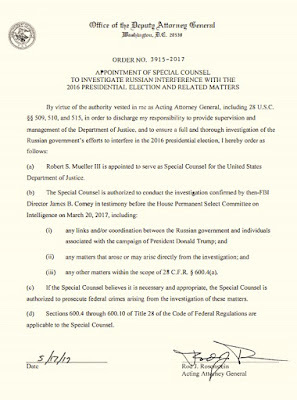 In a letter signed on Wednesday, Deputy Attorney General Rod Rosenstein appointed Mueller to the post, and tasked the former Marine with leading a “full and thorough” investigation into the actions of the Kremlin in the run-up to the Nov. 8th election. A chorus of praise went up almost immediately, especially from those who remember Mueller’s long tenure as FBI Director. In his analysis piece for Politico, Shenon observed: “It’s hard to imagine that this new job is any more intimidating than the one Mueller confronted on the morning of Sept. 11, 2001, when the newly arrived FBI director was forced to deal with the aftermath of terrorist attacks that left more than 3,000 people dead in New York and Washington and put the FBI’s very survival in doubt because of what would be shown to be its well-documented bungling before the attacks. THE SECOND piece of baggage is as heavy as the first one. According to various sources, this was presented to Trump right before he departed from the United States, and it could be a much weightier matter, one he’ll be hard-pressed to ignore. Multiple sources close to the intelligence, justice and law enforcement communities say that the House Judiciary Committee is considering Articles of Impeachment against the President of the United States. 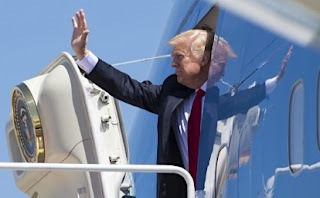 Sources further say that the Supreme Court notified Mr. Trump that the formal process of a case of impeachment against him was begun, before he departed the country on Air Force One. 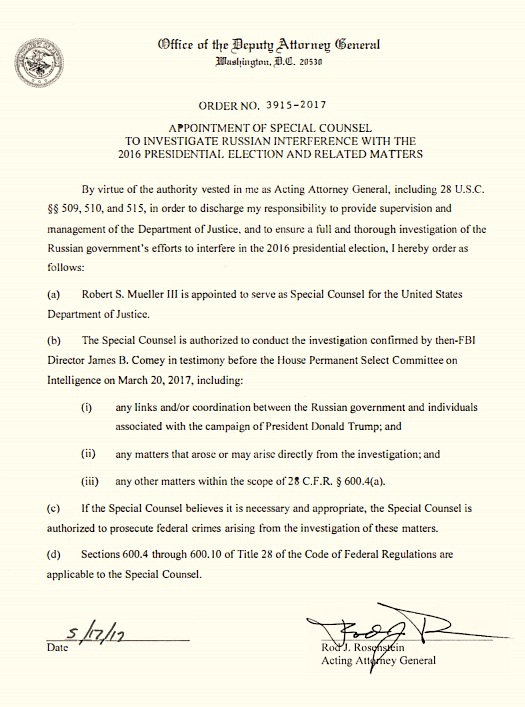 The notification was given, as part of the formal process of the matter, in order that Mr. Trump knew he was not able to use his powers of pardon against other suspects in Trump-Russia cases. Sources have confirmed that the Marshal of the Supreme Court spoke to Mr. Trump. As the drumbeat for investigation increases, we can expect to see and hear about more skeptical Trumpeters lawyering up, seeking to cut deals, hoping to satisfy their inner Monty Halls in the hopes of avoiding indictments. And at some point, for the crowd that left the United States on Air Force One days ago, there’ll be quiet reflection in days to come about what’s necessary to stay out of prison. Maybe they’ll make it an extended vacation. Image credits: Mueller: Doug Mills/The New York Times. Trump adios: Saul Loeb/AFP/Getty Images. -- senior Trump aide to The Daily Beast on May 15. HOMEOWNERS of any long standing will know that feeling of hyperadrenalized dread when, inexplicably, there’s a fire to be contained in your home — and fast. When you discover the flames that are way bigger than any you’ve seen before that were under control, you move almost in an autopilot mode: isolating the conflagration, looking for any smothering material nearby, moving the burning object as close to the tender mercies of water or a fire extinguisher as fast as possible ... and always being careful not to be a part of what’s going up in smoke. Working at the White House must feel like that right about now. On steroids. As if it hasn’t been bad enough over the last 120 days or so — with one self-inflicted distraction or another affecting the agenda of President* Donald Trump — a period of seven more or less consecutive days have thoroughly cemented the meme of willful chaos upon the Trump administration. 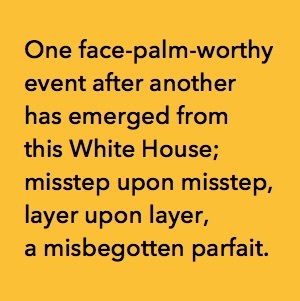 Day after day, one face palm-worthy event after another has come out of this White House, misstep upon misstep, layer upon layer, a misbegotten parfait. There’s been more than one costly screw-up to be minimized. There’s more than one fire to be contained. The Trump Hotel at 1600 Pennsylvania Avenue is in flames today, from the West Wing to the East Room to the White House lawn, as staffers weep and wail through broken teeth cowering behind the oaken doors of their offices, never far from the bellicose orange cartoon dirigible leading them, the mango Napoleon cursing and shrieking the instructions of a man who may be in the grip of the dark triad of malignant narcissism ... or maybe just a man in thrall to arrogance for the sake of arrogance. No one can say for sure. The halls of the White House are jammed with Dumpsters on fire; senior advisers scream at underlings who quake and dissolve in tears; a Brueghelian vision of rage and lamentations straight outta “The Triumph of Death” ... and somewhere amid the Brobdingnagian shitshow of the Trump White House, over the loudspeakers, the music we might have expected ... the inescapable strains of the Russian national anthem. The events of the last seven-eight days have come on us so fast, cascading over us in such dizzying fashion, it begs for some way to boil this madness down to something we can get our heads around. We need a scorecard. 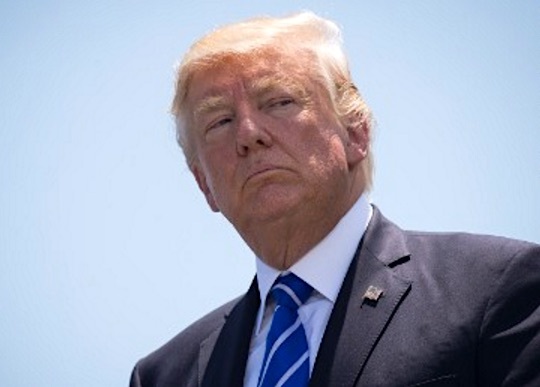 Start with what happened on Tuesday, May 9, when Trump fired FBI Director James Comey, in a fit of the petulant, defensive pique the president-presumptive is known for. Days later, The Daily Beast reported, “Multiple White House sources confirmed ... that the president was ‘furious’ in the aftermath — causing aides to spend the rest of the week drawing as little attention to themselves as possible. “An exasperated White House staffer on Friday described a different dynamic, saying the West Wing often struggles to keep up with Trump’s kinetic and unilateral public messaging operation and tweets and interviews that often diverge from the official White House line on the day’s events. “The resulting tension between Trump’s statements and those of the press office charged with maintaining his public image have some frustrated at their apparent inability to nail down a coherent narrative ...” Which makes sense: You can’t be any more coherent than the boss giving you your instructions. WEDNESDAY, MAY 10. The White House lets the Russian government steer the public narrative of Trump’s meeting with two top Russian diplomats by giving the Kremlin-sponsored media exclusive access to the event. Not The New York Times. Not The Washington Post. Not NBC News. Of all the unforced errors of the Trump administration, of all the events connecting Russia with the integrity of the 2016 presidential election, this one was easily the most easily avoided. It’s also the one most likely to yield malign dividends. It didn’t advance the Trump meme-let of financial invincibility when the markets cratered on Wednesday. The Dow Jones Industrial Average fell through the floor, shedding more than 370 points. And there was concomitant fallout elsewhere in the economy: The 10-year Treasury yield made its sharpest decline since last June; gold futures kept rallying; and the dollar, almighty greenback, declined to a point it hasn’t touched since Trump was named the winner of the 2016 election. It’s not just a domestic matter, either. 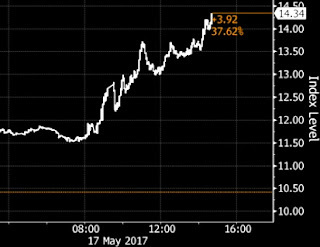 The CBOE Volatility Index, a measure of global economic turbulence, made its biggest jump since the Brexit vote. 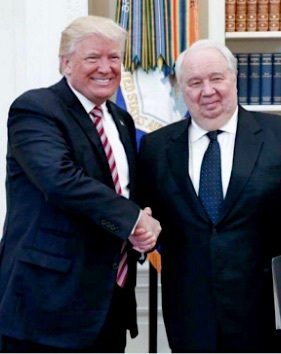 WE GOT THE MOAB of House Trump revelations on May 15, when it was reported that Trump knowingly, deliberately, eagerly shared classified information with Lavrov and Kislyak in the Oval Office. 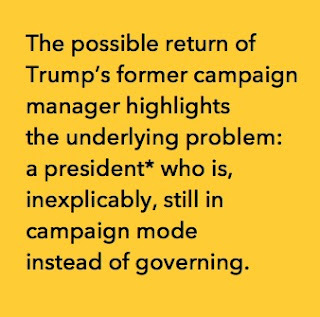 Some of those “deeper challenges” the Bloomberg News reporters wrote about involve persuading an increasingly skeptical public that Trump has the stones, the brain and the heart to do what’s required to right a badly-listing ship of state. A wave of the latest poll numbers suggests that won’t happen anytime soon. According to a Reuters/Ipsos poll released on May 19th, Trump is auguring in. In this poll, Trump's approval rating with the public has dropped to 38 percent, one of the very lowest it's been since his installation in the White House on Jan. 20th. That’s Reuters’ take. Gallup’s daily tracking poll was even worse; it reported on May 19th that Trump was underwater with only 37 percent approval. A May 19th Politico/Morning Consult poll, on how The Donald handled Russian-related intel, wasn’t any more charitable. A May 11 survey from Quinnipiac University had already said much the same, with Trump sustaining serious erosion of support from independent voters, white men and white voters with no college degrees, a major source of his voter base last November. 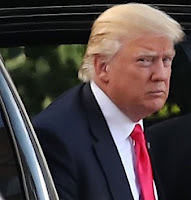 That survey, conducted over the phone with live interviewers among 1,078 voters nationwide from May 4-May 9, gave a Trump a 36 percent approval rating, compared to the 58 percent who approved. More unspinnable reality: Thanks to Trump & Co., the GOP is losing millennial voters at a dizzying clip. 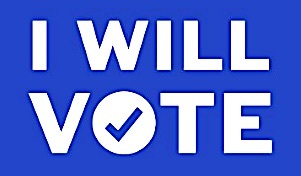 According to a May 17th Pew Research Center analysis, 23 percent of Republican voters ages 18-29 have switched parties since 2015, compared to 9 percent of Democratic voters in the same cohort. As many as half of Republicans 30 and under walked away from the GOP at one point in that two-year time frame. And then there’s the big poll, the one that matters right now: A May 16th Public Policy Polling survey found that 48 percent of respondents support impeaching Trump, while 41 percent are opposed. 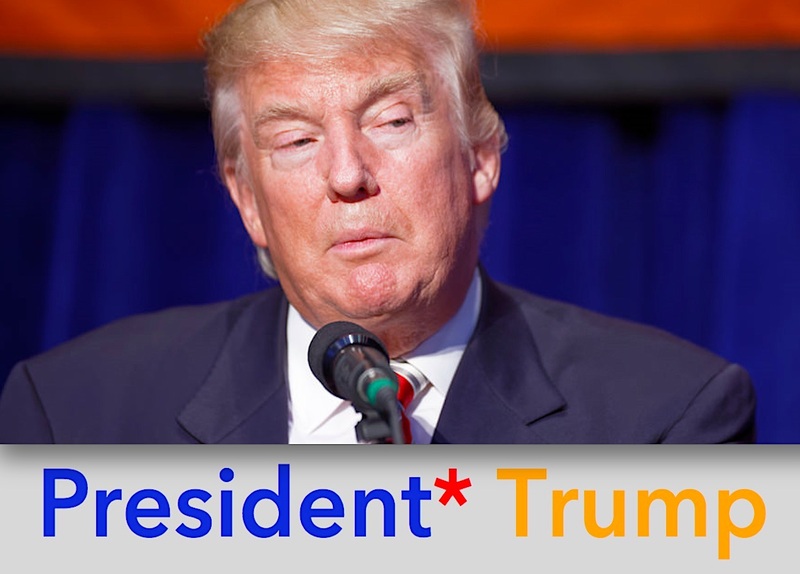 The same poll found that 45 percent don’t think he’ll finish his first and only term as our most deeply asterisked president. Forty-three percent think he stays the course. With the leadership of House Trump out of the country on its first foreign trip, now we can take stock of those recent seven days in May ... while we get ready for the next seven days, as the reports come back from various foreign capitals alerting us to the embarrassment we just know is coming. Students of American political history try to make sense of where a president’s going based on where he’s been and what he did when he was there. Trump’s first presidential overseas trip takes place later than any administration since President Johnson. On Sunday, Trump will meet with leaders from Gulf states, and deliver a speech to the leaders of more than 50 Muslim nations. From there, the trip continues with stops in Israel, the West Bank, Vatican City, Belgium and Italy. Image credits: Trump: Drew Angerer/Getty Images. 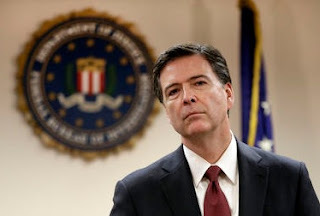 James Comey: via NBC News. Trump and Kislyak: Russia in the USA. VIX index chart: Bloomberg. Quinnipiac logo: © 2017 Quinnipiac University. 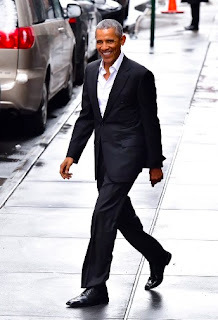 Barack Obama, out of the Oval Office for all of 111 days, has been refreshingly conspicuous in his absence from the White House. With some high-profile vacation stops — and some equally high-profile statements on pivotal matters, foreign and domestic — the former 44th president has undertaken to tweak the rules of ex-presidential decorum, and to stake out new rhetorical territory for a beloved leader on the world stage. You don’t have to be in the White House to speak truth to power ... and look pretty damn good doing it. Since leaving the White House, the former chief executive of the United States has been making all the right visible moves, with his partner in all things, former first lady Michelle, right at his side. Having lunch in Manhattan with U2 frontman Bono. Golfing in Hawaii, missing putts with the best of ‘em. Huddling with the chieftains of Silicon Valley. Breaking bread with Warren Buffett in Omaha. Chillin’ with Richard Branson on Necker Island in the British Virgin Islands. Getting some sun on Tetiaroa, Marlon Brando’s old haunt in French Polynesia. Image credits: Former President Obama: James Devaney/Getty Images. The Swamp logo: © 2017 Jerrick Ventures LLC. CAN YOU play ‘La Marseillaise’? Play it, and don’t wait for Rick Blaine to tell you it’s OK. Play it loud and long, turn the speakers in the direction of 1600 Pennsylvania Avenue and crank the volume up to 11 — on Twitter. That’s one way we can be sure that what happened over the weekend in France resonates with President* Trump and the rest of the all-wrong world of the alt-right. Early Sunday, the news was out: Emmanuel Macron, the centrist candidate in the French presidential election, had defeated Marine Le Pen, the isolationist-leaning right-wing National Front candidate, in an election characterized by many as a choice between nothing less than light and darkness. 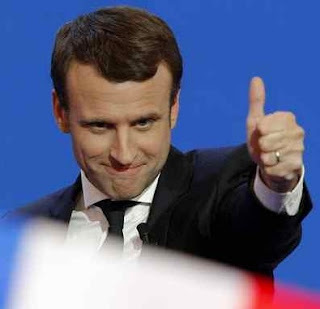 The vote has positioned Macron, 39, to become the youngest president in the history of France, and its youngest leader since — wait for it — Napoleon. In an election that was a statistical landslide — Macron beat Le Pen 65 percent to 35 percent, give or take — the French Republic made a presidential choice that was both a dramatic generational change and a strong signal that France, symbolized by its youngest leader in modern times, will very much contend for a leadership role in the shaping of what’s ultimately forged in the crucible that is Brexit-era Europe. And either because of those two factors or in spite of them, Macron’s victory as a centrist — in a France roiled with a rising immigration challenge and racked by terrorist violence perversely timed to sway the election — sends an unmistakable signal to the purveyors of the nativist campaign business model. Stephen Bannon, White House Trump consiglieri, suffers a straight-up repudiation of his plans, via his Breitbart News empire, to templatize the nativist perspective, starting with new web sites based in Germany and France late last year. First step in a global ALEC. “And that’s why we kind of laugh at, particularly cable news and sometimes other sites that, they sit there and they’re so wrong on everything. IT’S FAIR to say that Macron’s win shows the breadth of that geopolitical “tectonic plate,” the “bigger” he describes, has yet to be confirmed, or even proven. Coming after rejections of nativist and anti-immigrant thinking in Austria’s recent election, France’s support of a centrist agenda shatters the gathering sense of inevitability that the nativists have tried to cultivate in the wake of Trump’s installation. There have also been recent denunciations of the so-called populist agenda in Britain, the Netherlands and Italy. It’s not all over yet. Ryan Cooper reports in The Week: “There are legislative elections next month, where the National Assembly will be selected. If Macron or parties sympathetic to him don't win a majority, President Macron could be in 'cohabitation' with an unfriendly parliament — akin to divided government in the United States, and similar in terms of the resulting gridlock.” More widely, the German elections are set for September; a victory for the anti-immigration populists there would elevate their status in the one European nation that, on the basis of history, has a powerful vested interest in resisting such a slide back into intolerance. 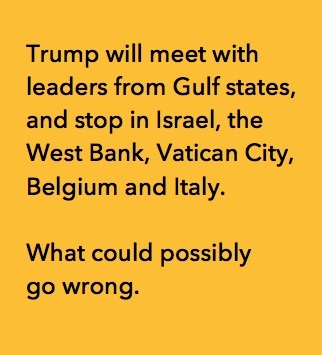 Such an event could reinvigorate populist fear-mongering in other elections across the continent. But for now, it seems, the weight of recent events, the pendulum-swing apparent, is moving the other way. Macron’s victory in France is more than just a win for a charismatic, forward-thinking leader, as impressive as it was. It’s also a victory for the idea that such a resounding, uplifting win is still possible in a time of deep skepticism and corrosive fear. France just got buried by a landslide of hope. What’s not to love? Image credits: Macron: Via Los Angeles Daily News. 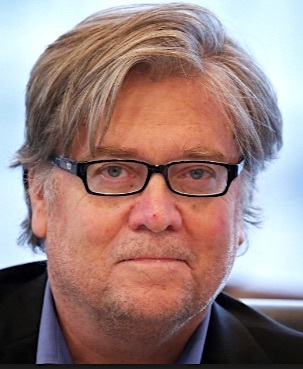 Bannon: Carol Allegri/Reuters. Less than four months into the unalloyed conservative triumph of Donald Trump assuming the presidency of the United States — an objective deeply desired and widely praised by think-tank and media conservatives — the symbol of American right-wing media and a leading conservative policy organization are going through major changes of their leadership and their missions. Just not the way they planned, or expected. Change comes at you fast, they say. For these groups, the sudden changes that have already taken place could lead to more upheaval, as the conservative bloc in Washington faces the prospect of having to realign its objectives with something called reality, the reality of changes they can’t control. Image credits: Heritage.org logo: © 2017 The Heritage Foundation. Fox News Channel logo: © 2017 Fox News Channel. The Swamp logo: © 2017 Jerrick Ventures LLC.